Similarly, a lot has been written about how much better 4 forward units are on the power play, but adoption of this approach is still far from universal, likely due to coaches fearing being blamed when their teams allow a shorthanded goal. With that in mind, one of the ideas I’ve been pushing for a while now is that teams should be playing with 4 forwards at 5-on-5 when they’re down late in the game. The thinking behind this tactic is pretty simple: when a team is down late they have little to lose from allowing a goal, and a lot to gain from scoring one. Micah McCurdy has written previously about this imbalance, presenting the idea of the “leverage” of a given situation. Leverage encompasses two things – first, the change in expected standings points of a goal scored at a given point in time with a given score (or the offensive leverage), and second, the change in expected standings point of a goal allowed at a given time with a given score (or the defensive leverage). The chart below has the average leverage values for a team down 1 in the 3rd period (I’ve folded together different score states and home/away for simplicity). We can see that as you get closer to the end of the game, the value of scoring a goal increases exponentially (since there’s little time left to score after that, or to be scored on). Similarly, as we approach the end of the game, the cost of allowing a goal also goes down towards zero – it doesn’t matter if you lose 1-0 or 2-0, so giving up an additional goal has little effect near the end of a game. All of which is to say that the incentives for a team down late in a game aren’t balanced – the benefit to scoring vastly outweighs the cost of allowing a goal. Given this imbalance why would teams not try playing with 4 forwards when they’re trailing late in the game? Coaches certainly seem to realize that there’s a point where it’s worth it to throw caution to the wind, as they’ve been pulling the goalie for an extra attacker as far back as 1931. Switching to 4 forwards could be used as an intermediate step, to ratchet up pressure without completely giving up on playing defence. Unfortunately, this strategy hasn’t exactly caught on with teams, and so we don’t really have a good dataset to work with. 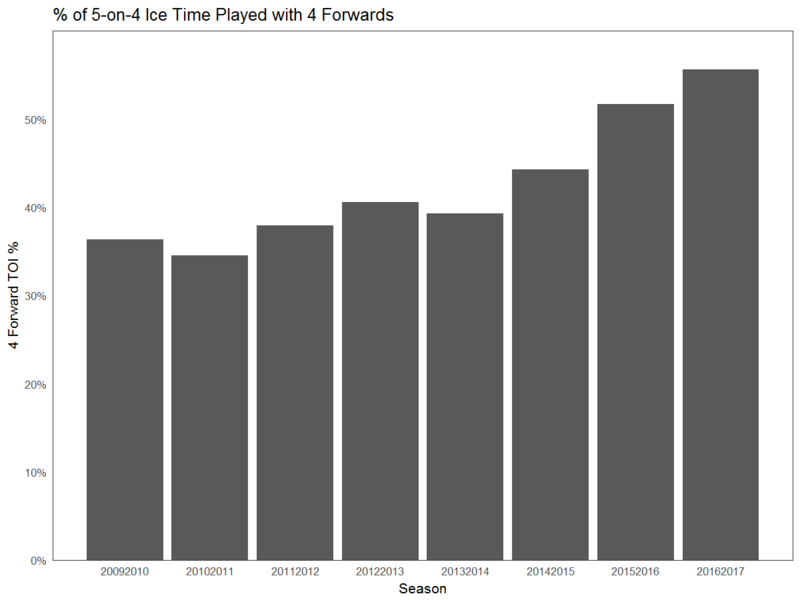 While teams have played with 4 forwards at 5-on-5 for over 700 minutes since 2009-2010, most of that time was immediately following the end of a power play, which doesn’t exactly make for an unbiased sample. Given our limited data then, how can we evaluate whether this strategy might work, without having to convince a handful of coaches to try it long enough to get a sufficient sample? One way to do it would be to guess the impact of using 4 forwards on scoring rates, and then evaluate the impact on a team’s expected points due to the change in scoring rates. If we can come up with a reasonable estimate of how much scoring would increase for a team playing with 4 forwards (and for the team playing against only 1 defenceman), we can use Micah’s leverage numbers to find the optimal time (if there is one) to switch to 4 forwards. One thing that’s interesting to see is that you will likely end up being a negative goal differential team if you use 4 forwards. While this seem to kill off the idea of using 4 forwards (generally you don’t want to be outscored in hockey, or so I’ve been told), because the value of a goal scored is much greater than the cost of a goal allowed when you’re down 1, it makes sense to increase the overall rate of scoring for both teams for a short period to try to tie the game. First, once a team switches to using 4 forwards, they’ll continue to use 4 forwards until they score to tie the game, or are scored on to go down 2 (the latter point is to simplify the calculation). Second, under both strategies, teams will pull their goalie with 1.5 minutes to play in the 3rd (and playing with 4 forwards prior to pulling the goalie will have no impact on how teams perform with an empty-net). With all the pesky details ironed out, we can (finally) look at whether this strategy might work. The graph below shows the predicted change in expected points versus the amount of time remaining when the team switches over to 4 forwards. There’s three things to note here: first, for a good portion of the 3rd period, switching to 4 forwards would be a net negative. This makes sense given the net negative long term goal differential for a 4F team. Second, the 4 forward approach is likely to result in a positive change in expected points if adopted any time after the 10 minute mark in the 3rd period. Finally, the ideal time to swap a defencemen for an additional forward, assuming our goal scoring estimates are right, is around the 5.5 minute mark in the third period. Any time before that and you’re likely allowing your opponents too many opportunities to score; any time after that and you’re probably not giving yourself enough of an opportunity to score. Although this initial approach gives us some indication that a 4 forward approach holds promise, we don’t have enough data to know whether our assumption of a 1.26x increase in goal scoring is valid. To get around that, we can test out various other scoring impacts and see how they change our estimate of when (or if) we should switch to 4 forwards, assuming the increase in goals against stays constant. For the purposes of this exercise, we’ll leave the goals against impact constant at 1.48, as that seems like a safe upper bound to me. While the size of the impact might vary, there’s still some indication that switching to 4F-1D late makes sense. In fact, even if you only see a 5% increase in your goals for rate, it’s still a net positive to switch after the 2:30 mark. Given that the evidence seems to point towards an offense-oriented 4F approach providing benefits when down late, how large would those benefits be for an average team? If we go back to the original graph and assume that teams change over at the optimal point (around 5.5 minutes for a 1.26X offensive impact), every time a team uses that approach it would be worth about 0.022 points. Since 2009-10, 35% of games have had one team leading by a goal with 5.5 minutes left, meaning an average team would play in roughly 28.7 of those games over the course of a season. If we assume that they’re leading in half of those 28.7 and trailing in the other half, that works out to a total benefit of 0.32 points over the course of a season. It’s not enormous, but at a rough cost of $1.5 million per standings point that’s a pretty valuable tweak for an NHL team. Even though switching to 4 forwards late likely won’t be the difference between making or missing the playoffs, it is one area where teams can give themselves a marginal boost in the standings without having to go out and change their roster at all. Given how difficult it can be to improve even slightly in today’s NHL, it does as if it may be a worthwhile tactic for a team looking to get an additional edge in the season to come. I remember the Sens using this strategy once, but I can’t think of any other times a team has done it intentionally. NHL teams, please make cheques payable to “Matt Cane”. Cash is also accepted. ← Who’s Getting Drafted This Year? Do the GF/60 and GA/60 ever change to a positive depending on the team? Say a team that plays a very defensive structure and good “200-foot” players? What about in the opposite situation, when a team is winning and attempting to hold a lead? Surely the situation is similar, but reversed: the value in scoring a goal diminishes, but the value in not conceding is incredibly high. As such, should teams consider putting out three defensemen and two forwards in those situations, since they should theoretically be better at clogging the neutral zone and suppressing shots in general? It’s an interesting theory but I’m not sure the defensemen are better at defense thing is true. I think the parts of defense that defensemen are good aren’t necessarily the same defensive skills that forwards have. No real evidence for that but that’s what I suspect.